Fevzi Mamutov returned to the Ukrainian land with a victory, which became another reason to be happy for the entire Crimean Tatar people. 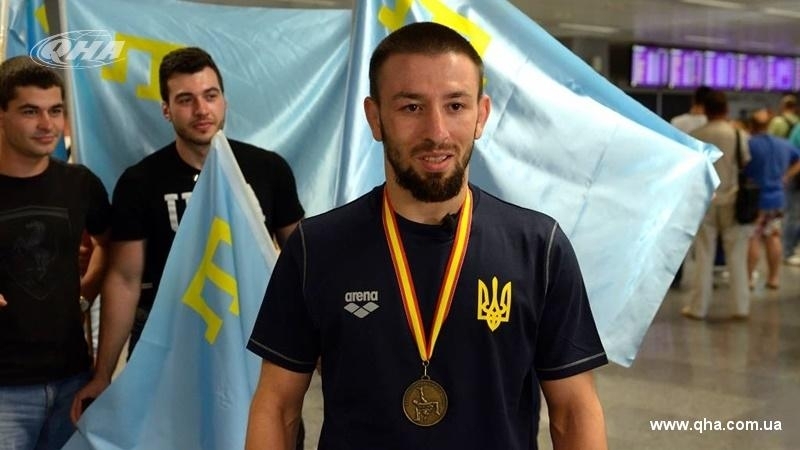 Greco-Roman wrestling champion of Europe Crimean Tatar Fevzi Mamutov arrived to Kyiv after a victory at the International “XVII Grand Prix of Spain” tournament. Despite the fact that Fevzi was the only sportsman in Greco-Roman wrestling from Ukraine at the tournament, he managed to represent his country with dignity. Fevzi Mamutov first defeated a sportsman from Japan, and then he defeated a representative of South Africa. In the final, the Ukrainian wrestler met with a French wrestler and won competitions prematurely. Relatives, friends and Crimean Tatar activists met with national flags our athlete at the "Boryspil" international airport. Fevzi noted that the competitions were easy, although rivals were serious. “The result was expected, as the training had being conducted. Training is the whole work, and success in competitions is just the result of this work”, the wrestler confidently says. The wrestler calls his victory another reason to please the family, relatives and the entire Crimean Tatar people, who are passing through difficult times. “Mamutov is a unique wrestler, he is non-standard in his own way, very flexible and plastic. Watching his fight is always interesting to specialists, because he is unpredictable wrestler. He is not afraid to take risks and it is important that he can compete to the last second, which is often not enough for wrestlers. He knows how to win. It is often said that Fevzi does not look like a wrestler. But a wrestler is not always strong shoulders and broken ears. Mamutov is a thinking wrestler”, Aleksandr Pastukhov, the Representative of the Greco-Roman Wrestling Federation of Ukraine says about the sportsman.